The supply chain has made the world a much smaller place. Low-cost manufacturing locations on the other side of the world used to feel like they were a world away. Today, you can find yourself on the other side of the world in the click of a mouse. Or, at the very least, about a day's travel. But what is the cost of this global shrinkage? A truck to get it from a factory to a forwarding location. A truck to get it from that forwarding location to a shipping destination. A forklift or a crane to get it from the shipping destination onto a mode of transport. An airplane or cargo ship. More trucks (at least two of them) to get it to your warehouse. Probably another forklift within your warehouse. While all of that can happen relatively quickly, that process can burn up a lot of fossil fuel. And while products have always needed to be transported from their manufacturing locations to their customers, the sheer volume of global manufacturing and the greater distances they have to travel—has amplified the impact to the environment. Nearly 30 percent of the greenhouse gas emissions in the United States come from transportation. As supply chains grow deeper into consumer neighborhoods, the pollution creep associated with that supply chain growth grows, too. One definition of an optimized supply chain is a supply chain that delivers your customers what they want, when they want it and accomplishes that by spending as little money as possible. It wasn't that long ago when that meant working your suppliers and your production teams to have your products on your loading dock, ready to ship. But Amazon changed the world. Now, more and more, a company's supply chain leads right up to its end users doorstep. That means that a company's supply chain environmental footprint can start half a world away in a low-cost manufacturing region and continue until it touches the home of every one of its customers. Consider that. The toothbrush you just ordered from Amazon began its life as plastic resins and injection molding tooling thousands upon thousands of miles away from you. The carbon footprint your toothbrush created—just to travel to you—spanned the globe. 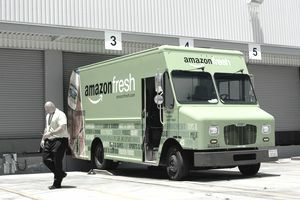 The sight of a delivery truck dropping off packages on a Sunday used to be limited to a few weekends around Christmas—but is now common throughout the year. That increased level of transportation activity has concerned scientists because of the environmental impact. And supply chain professionals have also paid attention to this trend, as well. It might be for environmental concerns, but it's also for cost reasons. As far as that last pillar is concerned (cost control)—transportation and fossil fuels are a major contributor to cost. Can supply chain help improve the global impact of transportation pollution—not because of a direct concern about the environment—but for supply chain and cost optimization reasons? In heavily trafficked supply chain hubs—like the Port of Long Beach in Southern California (which is the fifth largest port in the United States and in the month of January 2018 alone it moved over 650,000 containers through the harbor), cargo trucks are lined up 24/7 to move goods. Those trucks now have strict idling restrictions and operating criteria to reduce the level of greenhouse and the costs of refueling those vehicles. One of the biggest changes to the environmental impact of transportation will be the proliferation of electric and autonomous transportation equipment. In the way that toll booths are almost exclusively unmanned, cargo trucks will also become driverless and electric. Drones will be used within warehouses and in neighborhoods to deliver to your customer's doorstep. Some say that the shift to autonomous and electric vehicles simply shifts the environmental impact away from transportation and to the facilities that manufacture those vehicles. But supply chain professionals have skin in the game of transportation pollution reduction. Global supply chain did indeed shrink the world. And it is up to global supply chain to be part of the solution in reducing the resulting environmental impact. How Can I Improve Supplier Performance? Could a Green Supply Chain Benefit Your Company?